Epec Engineered Technologies, an industry leader in high reliability manufactured electronics, has recently announced a new version of their online circuit board quote and ordering tool, InstantPCBQuote. The new InstantPCBQuote was released at the end of August and has been in beta for about a month. This new version has a more modern look and feel, supported by a more advanced back-end infrastructure. It is now also more compatible with recent web browser changes and various screen resolutions. “Our IT and Marketing teams have been working on this for about a year now and we are excited that it has finally been released. The goal of this re-launch was to make the site more user friendly to ensure a great experience to our customers”, shared Keith Araujo, Director of Marketing at Epec. Epec has also included several new quoting options for rigid PCs including, copper weights up to 5 oz, finer trace/space options, and gold fingers up to 50 u. Advanced options now include via in pad, blind & buried vias, counterbore, plated edges, countersink, controlled dielectric, and controlled impedance. InstantPCBQuote is coming up on its 10-year anniversary in 2019. 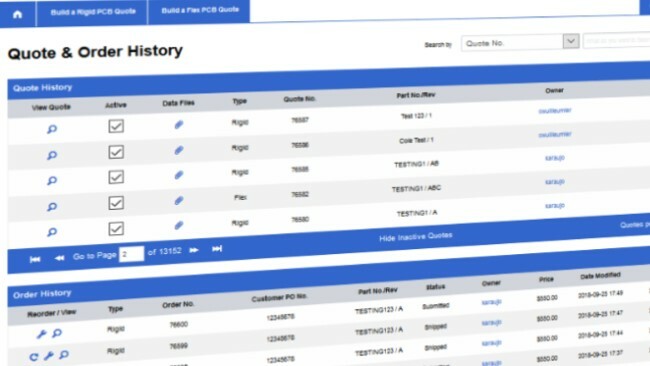 We are already working behind the scenes on incorporating additional functionality with the goal of keeping InstantPCBQuote as the fastest and most accurate online PCB ordering tooling in the industry. Epec Engineered Technologies is the ideal choice for an OEM seeking customized product solutions from a focused and agile partner having supported over 5,000 customers across all sectors of the electronics industry. By providing highly experienced technical resources, a proven manufacturing platform and the fastest delivery in the industry, we are able to provide cost effective and innovative solutions that deliver the highest reliability products to the market faster. Visit http://www.epectec.com/ for more information.